What do you do when you want to spend time with a friend but you've got a combined number of children that rivals the size of an actual school class? My dear friend Lisa and I have been in the motherhood trenches together for over two decades. We both have 8 children, and I kid you not, awhile back we entered a Chinese restaurant after church and one of the diners there asked, with gaping mouth, "Is this a Sunday School class?" 1. Buy red plastic cups and label them with each child's name. 2. Plan a schedule for the time you'll be together. Likely you have order to your day at home - why abandon it when with another homeschooling family? 3. Pair up the children for periods of time. This has been a neat thing as we've seen different relationships between our children develop that might not have happened naturally. Now at 22 down to seven years old, they're genuinely interested in each other's lives. They do activities we create for them for 15-30 minutes and then switch to another like schedule of activities, including everything from watching a video to helping each other with schoolwork to baking cookies. We are sensitive to the fact that the older ones like to spend time together playing games and such and so we schedule that for them, too. 4. Make a quiet hour mandatory. We have done this different ways: letting everyone be in one room together, pairing up children in different rooms, and separating everyone into different areas of the house. They read books for an hour and cannot socialize. Lisa and I then get an uninterrupted hour to chat together and the children get a rest. 5. Plan a service project to do together. One time we packed lunch bags to hand out to the homeless. Another time we filled a care package for missionary friends. 6. Use your time together as a mini co-op. What subjects do you both teach that you can pair up on? For example: One day I had planned to teach history to my children so Lisa left hers here while she ran errands and I taught the whole group our lesson for the day. Just as easy to teach eight as it is to teach four. What Are Your Most Helpful Homeschool Management Posts? I recently discovered your website. I’m working on making a “battle plan” for our upcoming school year. I’m homeschooling a rising 3rd grader as well as raising and caring for my twin two-year-olds. What a blessing! I need all the help I can get to figure out how to attend to my preschoolers while homeschooling and maintaining my home (among other things). Please point me to some of your favorite posts on the topic. I’ve listened to your MP3 downloads and they helped tremendously. A homeschooling mom needs help with the housekeeping, because kids who are home all day long make messes at home all day long. They'll also gain great skills if they're taught to help out. Start with a chore plan. Read the next chore post. And then finally this one, which gives you free chore charts to download and use in your home. Circle Time is the biggest weapon in my arsenal. You can read all about Circle Time here, and link to copious posts on the subject. You can learn some little tricks for keeping those busy two-year-olds occupied during Circle Time here. If you're looking for school help, learn my BIG SECRET here. The best part of the BIG SECRET is that once you're done, you're done. But most importantly, bring your children to the Gospel every day. Remind them and yourself that you are loved and Jesus is enough. p.s. Michele and I both wrote chapters on homeschool management for The Big Book of Homeschool Ideas. It's a treasure trove! I've been homeschooling for 17 years and I gleaned so many great ideas from all of the capable contributors. Worth it! I was having a conversation by text this afternoon with another homeschooling mom of several kids and we were both talking about how we felt our children didn't really, truly understand that our time is valuable and our money is hard-earned. No, we don't earn money for being their mother and teacher, but our time still has value and their daddies aren't just working for fun! It's easy to feel taken for granted when a child wants you to take them all over creation or to be involved in an activity that will require multiple hours per week of driving time, without any consideration of the impact on me as their primary caregiver or on the family budget when a tank of gas in a 12 passenger van is more than even Ben Franklin can cover. In an effort to combat a sense of entitlement that very quickly can overtake us, my husband and I have started explaining to the older kids a little bit more about our reasoning behind decisions that we make. Not because we want the children to feel guilty at all, but because we want them to understand that we're not just making decisions willy-nilly. You want the family to get frozen yogurt tonight? That means we can't go out to eat with our friends after church next week. Make a choice. You want me to drive you to your friend's house across town, which costs $15 in gas and two hours of my time? How can you help me get my work done so that I have the time available to do that. You lost your math/piano/science book? That's the equivalent of the cost of a family meal at home. Better break out the piggy bank. You want to take a family trip to Disneyland? That is outside our normal family budget. Are you prepared to drop all extracurricular activities for a year to help pay for it? Obviously we don't let our kids make all the decisions, but we want them to be aware that everything has a cost - either the cost of time, money, or other resources. When we say yes to one thing (like getting frozen yogurt as a treat) we are saying no to something else. There are times, like with the request for Disneyland, when the child will quickly say no, it's not worth that sacrifice. But there are other times, like when wanting to see a friend across town, that they will work hard to help me so that I have free time available to help them. There are still occasionally tears when someone doesn't follow through on their end of the deal and I have to say no, I'm sorry we can't do xyz. It's tough being the mom, but someone has to do it. 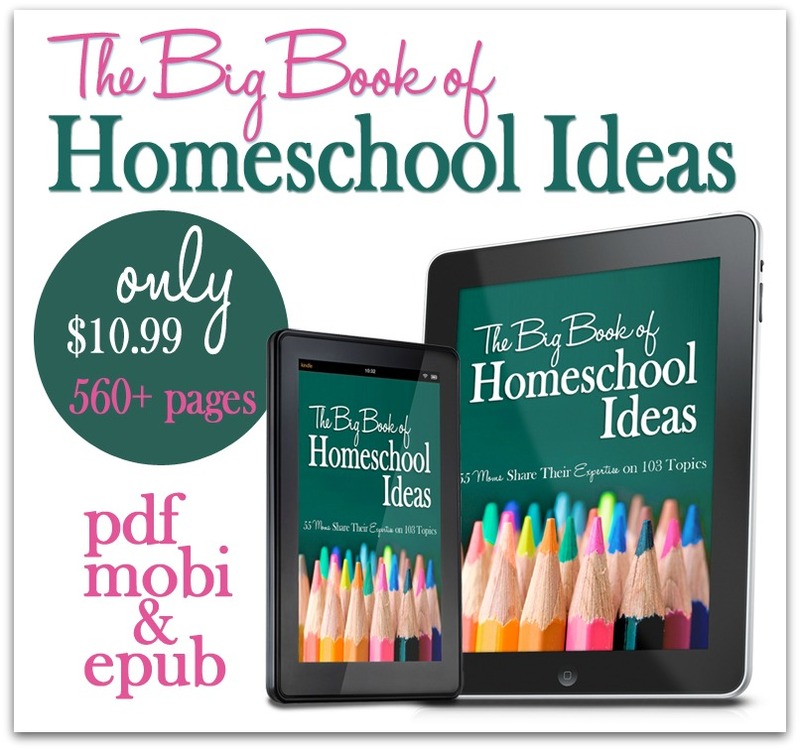 The Big Book of Homeschool Ideas is Here! Hey Preschoolers and Peace readers! Michele and I want you to know that we are both contributing authors to the brand new The Big Book of Homeschool Ideas, and we think it's a quality product you'll be so glad to have on hand. Covering every age group from newborns to college students, topics from geography to foreign languages to science to English, troubleshooting your big questions like, "What if my child hates math?" and really, so much more, The Big Book of Homeschool Ideas is a resource we think we'll turn to again and again. Click on over to see the landing page and all of the super helpful chapters from homeschool bloggers you've come to trust and love and some you'll discover for the first time! Our links are affiliate links, and we will receive a portion of sales, which then goes to help us pay our expenses for the Preschoolers and Peace site. Thanks! Is it time for your kids to take over a meal in your home? If they're over 4, I think the answer can be yes! Especially lunches, which can be grab-and-go. Free yourself mama. The mess you might have to help clean up will pay off as they grow up and become more independent. Work yourself out of the summer lunch job! dump refried beans, salsa, and cheese in the slow cooker on the back porch an hour or so before lunch. The house doesn't heat up! Serve with tortillas chips. This girl loves helping in the kitchen! Frito Boats - corn chips topped with chili and cheese - stick the chili in the slow cooker, too! What's not on my list that you would add?